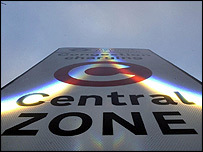 A proposed emission-related congestion charge (ERCC) will increase pollution and traffic, a report has said. The Land Rover-commissioned reviews said the £25 toll on the highest CO2 polluters was "a risky white elephant". The study by the Centre for Economics and Business Research said more low-emission vehicles, which would not be charged, would enter the toll zone. Transport for London said it was not surprised a report commissioned by Land Rover came out against charging cars. London Mayor Ken Livingstone proposes to raise the congestion charge from £8 a day to £25 a day for vehicles emitting higher CO2 levels, and scrap the charge for the lowest emitters. The research centre's report said the plans could add an extra 4,000 to 10,000 cars to central London's roads and could cost up to £50m in increased delays. The centre's chief executive, Douglas McWilliams, said it was unclear whether an ERCC would have any benefits in terms of tackling climate change, reducing congestion and improving air quality. "Indeed, there is a reasonable chance, even by their own admission, that the ERCC will worsen congestion, increase greenhouse gas emissions and further deteriorate air quality," he said. "This supposed green tax could be a costly and risky white elephant that make the capital less green." A Transport for London (TfL) spokesman said: "It is not at all surprising that a report commissioned by Land Rover has come out against charging cars according to the emissions that cause climate change. TfL has already given a cast-iron commitment that we will carefully monitor the introduction of the scheme, should it go ahead, to ensure reduced congestion and CO2 benefits are maintained." A spokesman for Land Rover said it commissioned the report to better understand the impact of the ERCC on its business. "The report was independent and Land Rover had no influence on the Centre for Economics and Business Research's methodology or findings," he added. The ERCC proposal is currently out for public consultation which ends on Friday.